Elsie's new role as wife of the Leader of the Federal Opposition brought with it many social obligations, and presumably demands upon her purse to maintain a high standard of couture. In 1940, Elsie celebrated her fiftieth birthday in John's absence. The Perth Labor Women hosted a big celebration, whose guest list included WA Labor Premier John Willcock and his wife; several members of the State Cabinet; Edward Needham, a retired Labor Senator, who has sometimes erroneously been described as one of Elsie's relatives; the State Secretary of the ALP, Percy Trainer, and the Lord Mayor of Perth. 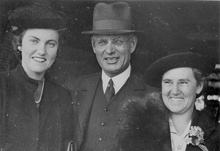 Leader of the Opposition, John Curtin with his wife and daughter, 1940. The Curtin house, Cottesloe, 1939. Records of the Curtin Family.